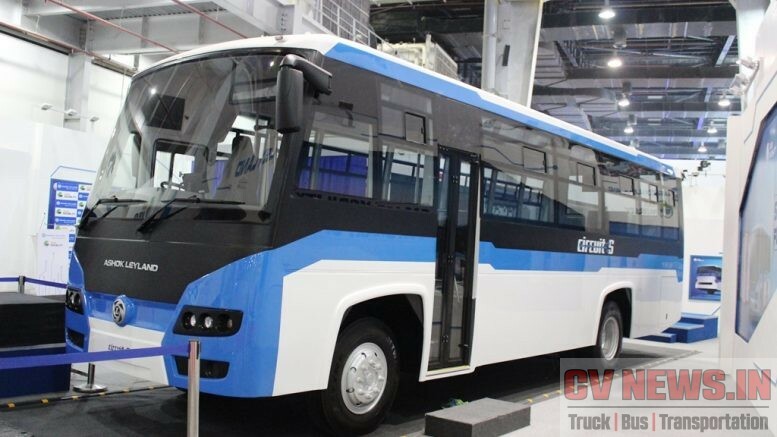 Indian bus market is fast changing and yet, it has its own set of uniqueness. We have high end premium rear engine coaches at one side and front engine buses at one side. Though premium multi axle rear engine coaches occupies major highways in Intercity application, its the front engine buses that has the maximum potential in terms of volume and opportunity. BharatBenz as we have seen in the past, have developed products suiting to Indian market conditions and truly lives upto the brand name ‘Bharat’Benz. 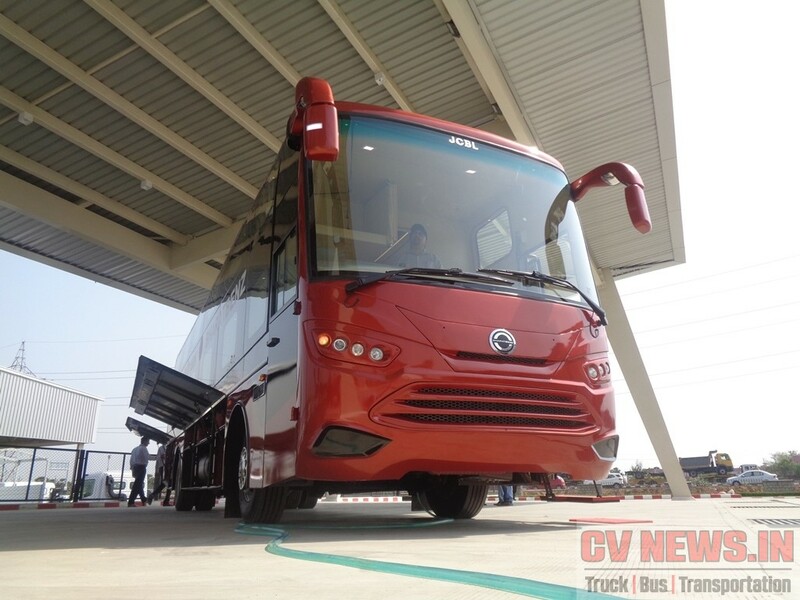 Brand started its bus journey with 9T ICV fully built bus and the bus has carved its own premium in its category. Available in both Staff and School bus variant, the bus is available as a fully built. 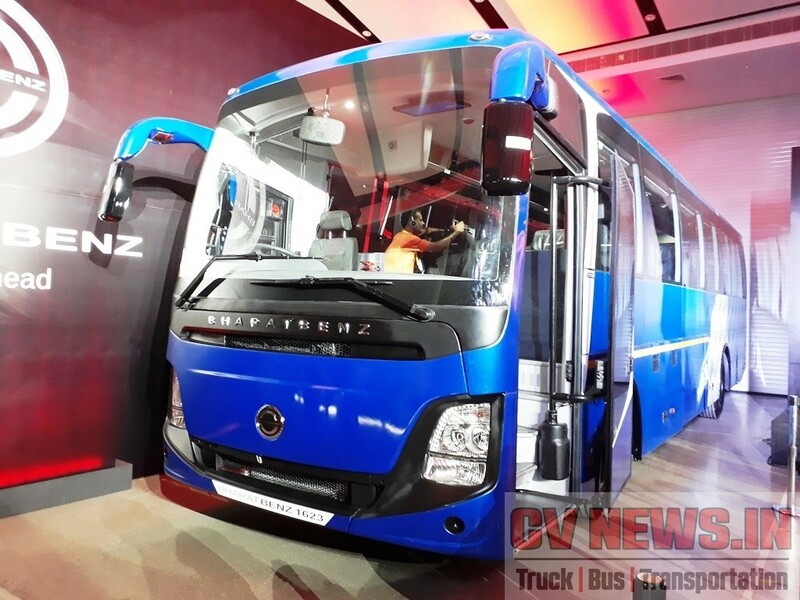 Extending the bus product portfolio, BharatBenz has launched the 1623 – A Front engine coach. Available in both Chassis and fully built, 1623 addresses Premium intercity front engine segment. Primarily we can classify Indian Intercity bus market into two. 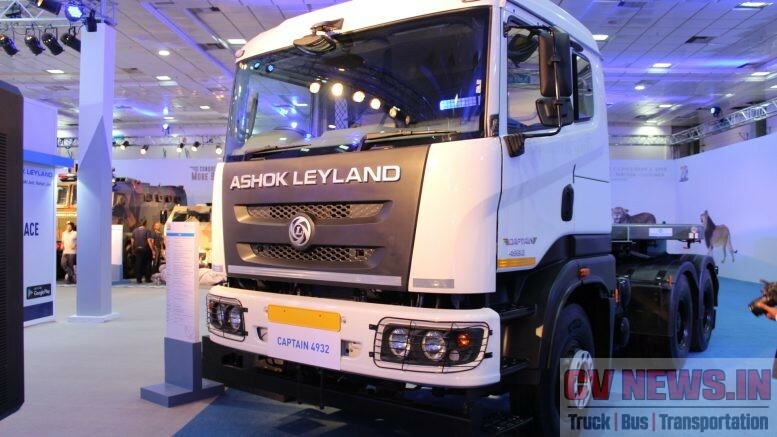 The niche small Premium segment, addressed by Volvo, Scania and Mercedes Benz and the large Value segment, addressed by Ashok Leyland, Tata motors and Eicher. 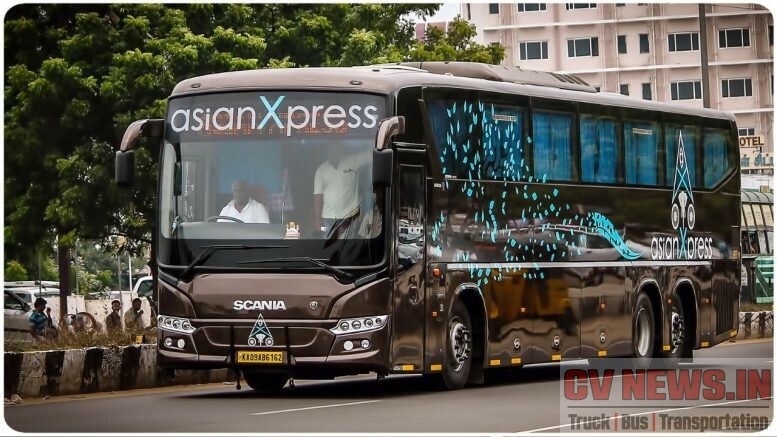 The total volume of Intercity segment in Indian bus industry is estimated at 5000 numbers and that includes premium coach volume at around 700 numbers. The value segment can further be sliced into three depending on application and duty cycle. Non AC segment, which operates around 500 kms, AC segment which operates between 500 to 600 Kms and Premium AC segment which operates upto 800 Kms and beyond. There are always overlapping in these applications, but for better understanding, we have categorised this way. 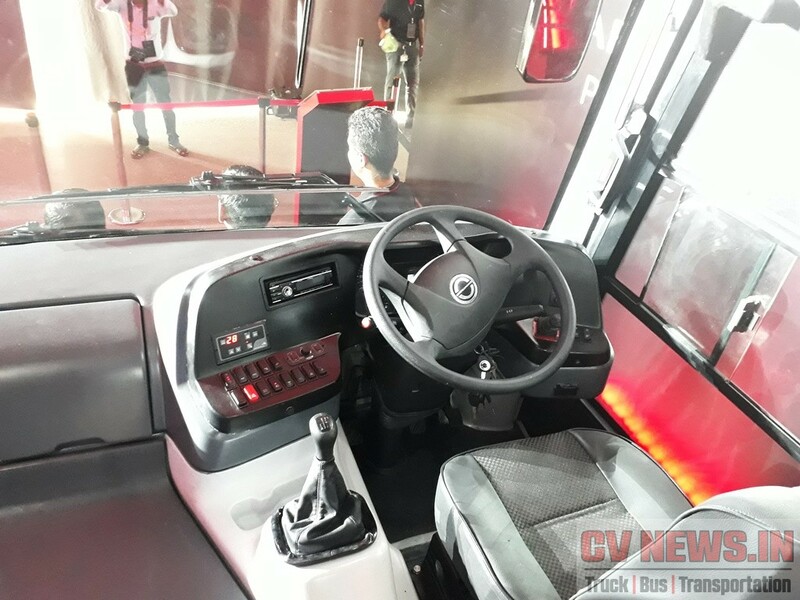 BharatBenz 1623 fits into the third segment – Premium AC front engine coach segment. Baring Man, this segment was so long addressed only by Ashok Leyland for past 8 years with its 12M 205 hp BS II then, 12M 225 hp BS III now and 12M 225 BS IV, in coming days. 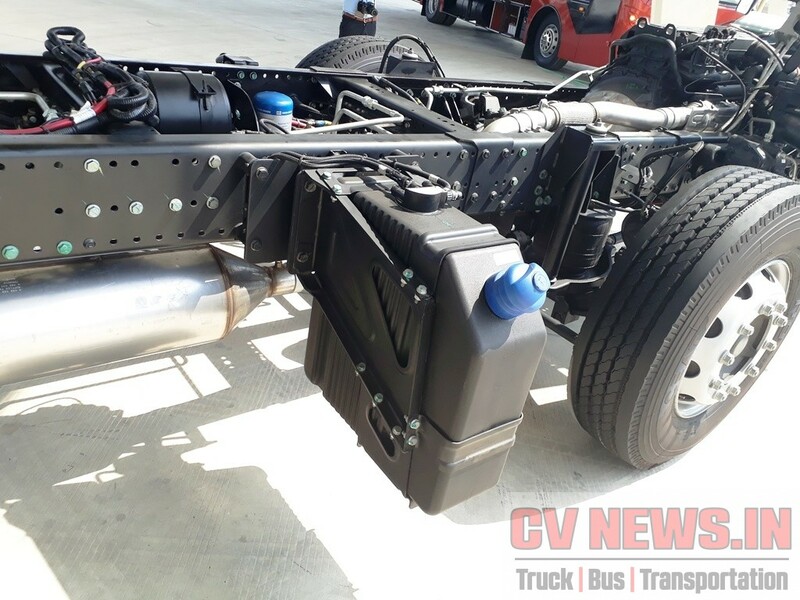 Quicker turn around time and hence higher horse power engine, air suspension for long journey, engine driven AC, longer service intervals, higher durable and reliable aggregates are some of key buying requirements of Customers, for this application. The requirements from Customers are very demanding and challenging. 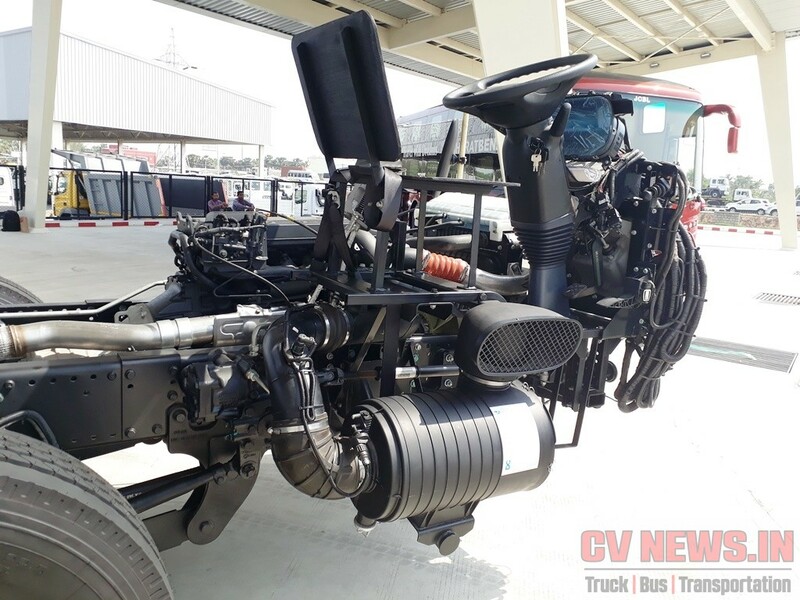 Lets take a close look, on how Bharatbenz 1623 is addressing these Customer requirements. 1623 is powered by DE175BSIV 6 cylinder inline, 6.4L, Common rail diesel engine developing power of 238hp @ 2200 rpm and torque of 850 Nm between 1200 rpm to 1600 rpm. The drive line includes 6 speed synchromesh overdrive gear box, and a single speed fully floating rear axle with an axle ratio of 4.778. The ratio is shallow, as higher top speed is one of primary requirement of segment and its complimented by higher power engine. The ratio’s are optimised to have best in class restart gradeability at 25.1%. 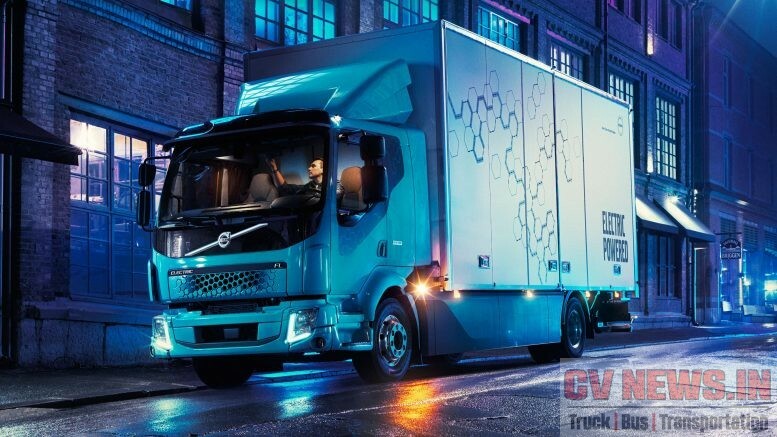 The gears are engaged via an ergonomically positioned cable shift change speed operation – CSO lever, for better comfort and reduced fatigue to drivers. A larger single plate dry clutch with a clutch facing dia of 395mm is used and its hydraulically actuated with aid of pneumatic clutch booster. 1623 uses SCR technology to achieve BS IV emission norms and hence we have additional 60L Ad-blue tank. BharatBenz has claimed urea consumption at around 1:20 ratio to fuel. A semi transparent De-Aeration Tank (DAT) is fitted over the radiator and opens towards front. Similarly power steering reservoir is fitted on LH Frame Cross Member – FSM, both of them can be accessed through front grill. The air filter is located on the right side below driver seat and air intake is from side ways and filter replacement is from front side. To aid air suction, coach has slits on sides, near front wheel arch to facilitate air suction. Air filter, Power steering pump fitment. 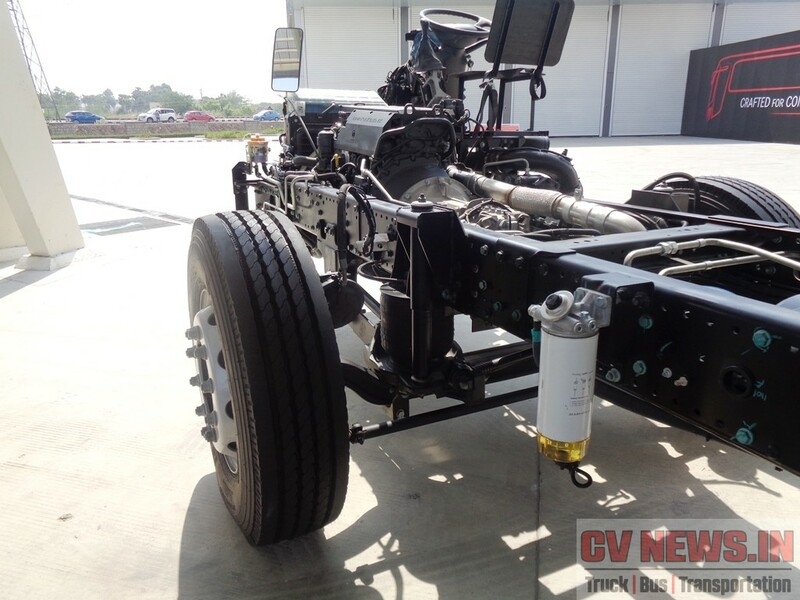 The Chassis is a typical straight ladder type chassis with a floor height of around 1200mm. Surprisingly the chassis didn’t have a rear closing cross member, and it was explained that it wasn’t required as chassis has cleared the required torsional tests even without that. The front frame support brackets, both LH and RH are made of robust cast metal, that further strengthens the frame and minimise damage to the driveline, in case of a frontal impact. A 380 L fuel tank and 60L Ad-blue tank are fitted next to front wheel and occupies bulk of right side. The fuel water separator along with diesel priming pump is fitted on left side just behind the front axle for easy access. 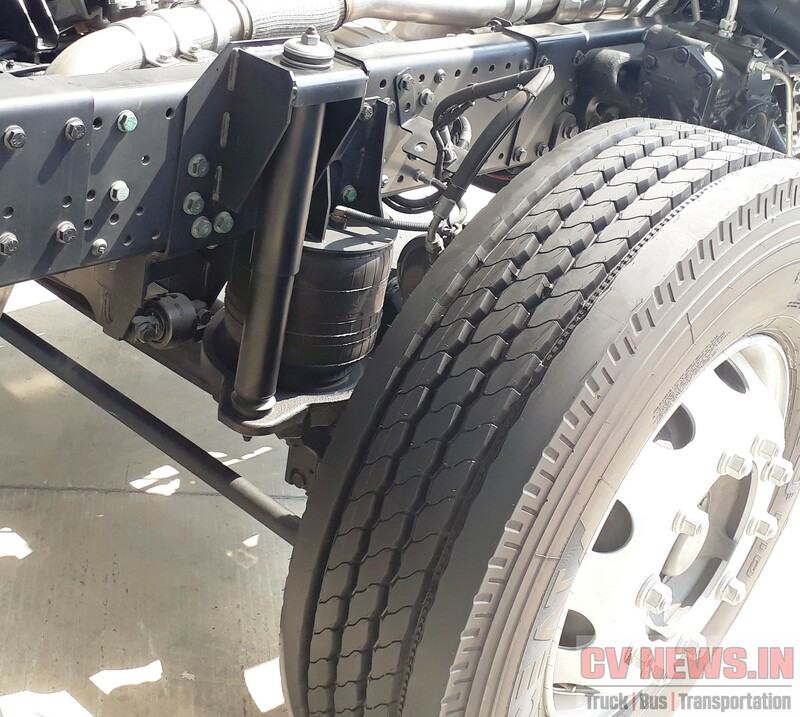 With optimal leading dimensions of Wheel base at 5950mm, front over hang at 2422 mm, rear over hang at 3558 mm, and a higher steering lock angle, the coach has a lowest TCD at 19.4m. This is by far the best in class, considering drum brakes and ensures excellent manoeuvrability and aids parking in tight space. Not to mention about wider front track at 2040mm, has an impact in lower TCD as well. ZF is the power steering supplier and the steering column is both rack and reach adjustable. 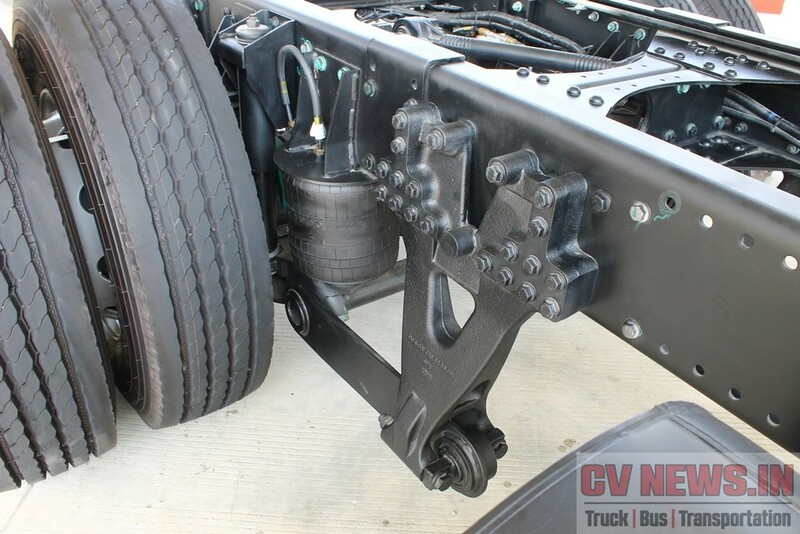 Chassis comes fitted with drum brakes and is foot operated via full air dual line ‘S’ Cam. Wider 8″ brake liners are provided at front and back, and with larger 24 brake chamber develops adequate braking. The chassis also comes with electromagnetic retarder as an option. ElectroMagnetic retarders are additional friction less brakes actuated through electric current. Electromagnetic retarders are very precise and quick in response as they get engages within 20 micro seconds of actuation and work from as low speed as 20 kmph. They are CAN controlled and work in tandem with service brakes.’Telma’ from France, does the duty here and has demonstrated a high level performance and reliability in past. Presence of retarders increase the life of service brakes as much as 30% to 40%. The retarder can be multi stage actuated with a hand controlled combination switch though they are fully integrated via foot operated brake pedal. Though, retarder is given as option, we only wish that it should be offered as standard fitment. In addition to this, coach also has engine and exhaust brakes. Exhaust brake is electro-pneumatically actuated butterfly valve type and is fitted in the exhaust pipe. Engine brakes or top brakes what Mercedes Benz calls, is an additional valve in the engine and is electronically controlled. When activated, it opens exhaust valves in the cylinders after the compression cycle, releasing the compressed air trapped in the cylinders, and slowing the vehicle.1623 also has 4 channel ABS, and complements with service, exhaust and engine brakes. 1623 is full air suspended with Daimler designed front and rear air suspension. There are two air bellows and front and 4 at rear. Bellows are frame mounted and the design is quite new. 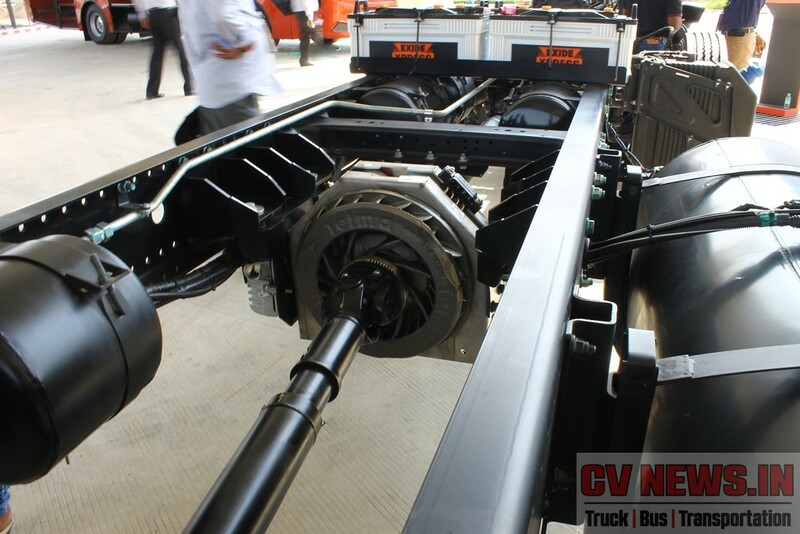 We also understand the same design can be used for 4×2 rear engine coach as well. The suspension is basically stabilizer controlled and comes with double acting shock absorbers and anti-roll bars and front and rear. The integrated link and stabiliser unit at front and rear gives greater axle control and extra stability during rides. BharatBenz calls the suspension as ‘Glide Suspension’ and is calibrated to enhance chassis performance and minimise jerks and rolls. 295 section tubeless radials are standard fitment for the coach. 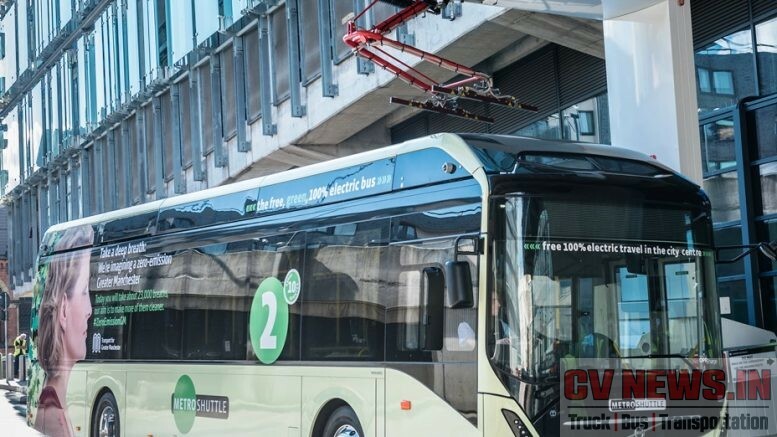 The body is licensed from ‘Wrightbus’ and is fully built at same facility. The body of 1623 is unique as its made of Aluminique – an alloy of aluminium and is fabricated without any welded parts. 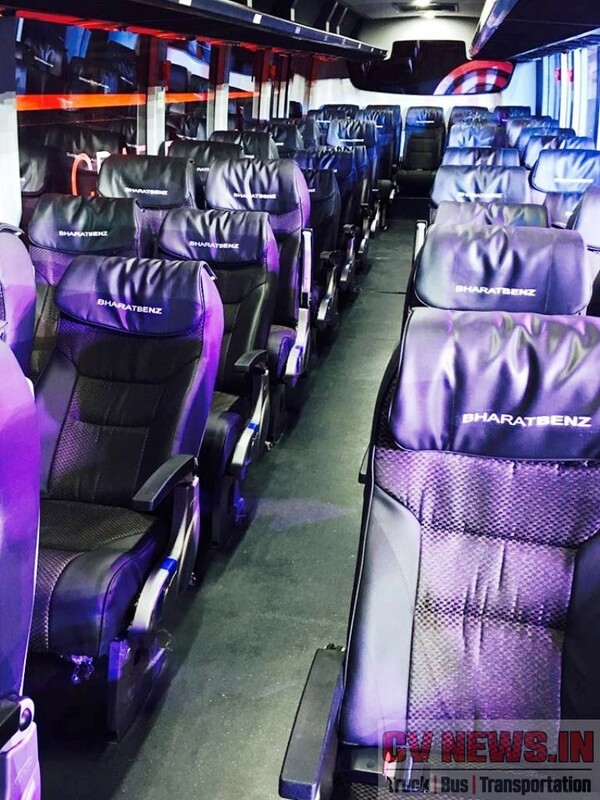 The premium Mercedes Benz, Super High Deck coach is also built using the same technology. This type of body gives extra strength, lowers centre of gravity and offers high level of stability. The combined advantage of this is evident in a way that, Coach has cleared the most stringent safety standards for roll over as per AIS-031, at ’46 deg’ tilt angle as against the ARAI recommended tilt angle of ’28 deg’. With this we can easily call it as the ‘Safest Coach’ with respect to body roll. BharatBenz has claimed upto 1T reduction in weight due to Aluminium body. The coach has a 2×2 layout, seating capacity 43 with out calf support, and 39 with calf support. Seats are supplied by Harita, and saloon is spacious with wider gangway of 400mm and with a higher seat pitch of 850mm. Hatracks are modular, and Integrated service sets are provided with reading lights, speakers, adjustable AC vents and call switch. Coach is Air conditioned via 32kW AC and an option of Thermoking or Eberspacher can be chosen by Customer. Entry to saloon is via an 5 step outswing passenger door at Front Over Hang, FOH. 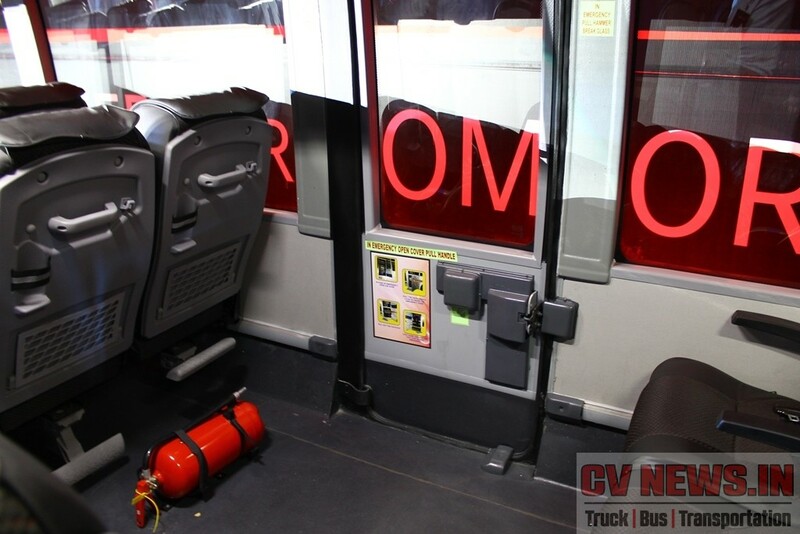 Floor is made of Marine grade plywood and the vinyl flooring comes with an anti-skid top layer and fire retardant materials, which are provided to ensure a safe walkway for passengers in case of emergency situations. Side glass are fixed and toughened and are breakable in case of emergency. Emergency exit is provided at the right side and has a wide opening door of 730mm. In addition side and rear glasses can be broken. Passenger entertainment is via 22″ LCD television and head unit comprises of CD/DVD/radio player. Additionally Public Addressing system is also provided. Driver work area is ergonomically designed with height adjustable steering and driver seats. The clusters and telltales are easily readable. The driver actually sits little low in contrast and this ensures, he has minimum front blind spot. The outer view mirrors are electronically adjustable and panoramic swing wider wipers ensure clean swipe. BharatBenz has a strategy for chassis sale and will have a non-competing clause with body builders to build body. This means the 6 preferred body builders will be building body types which aren’t made by BharatBenz. 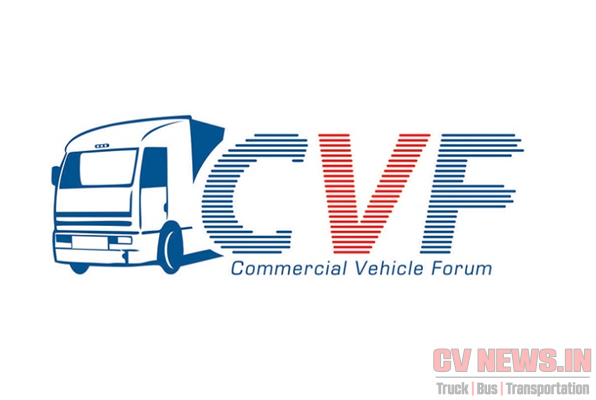 Effectively the sleeper bodies will be built by third party body builders and for seaters its the company built body. Front view is show stopper. Wider lower grill and openable upper grill aids serviceability. 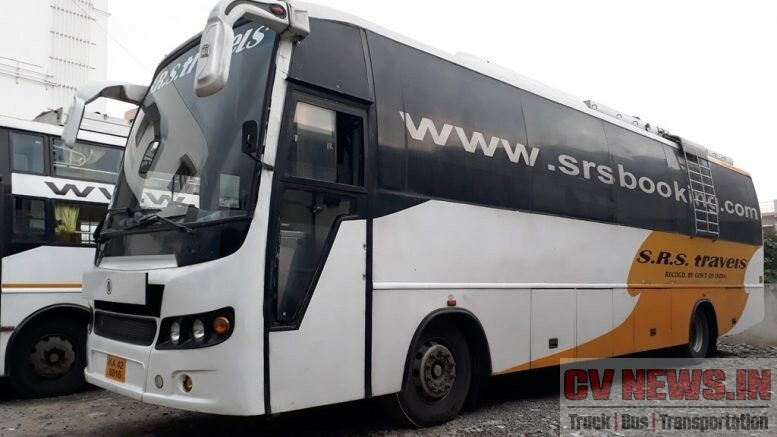 JCBL, Chandigarh is one of the preferred body builder and have exhibited a sleeper coach built on 1623 chassis. The reception, this coach has received from our readers is something outstanding. From the moment we started posting details about the this coach our traffic to our ‘website’ and ‘FB’ page was increasing constantly. Organically, the sleeper coach related info was shared by more than 7000 times and reached more than 200,000 people in less than few days , and by far the highest number of shares and reach we have witnessed from our page in a short span of time. A “big Thumps Up” to team JCBL for bringing out a stunning coach. The coach offered has a capacity of 30 berths in 2×1 longitudinal layout. The windows resemble trains and looks impressive. 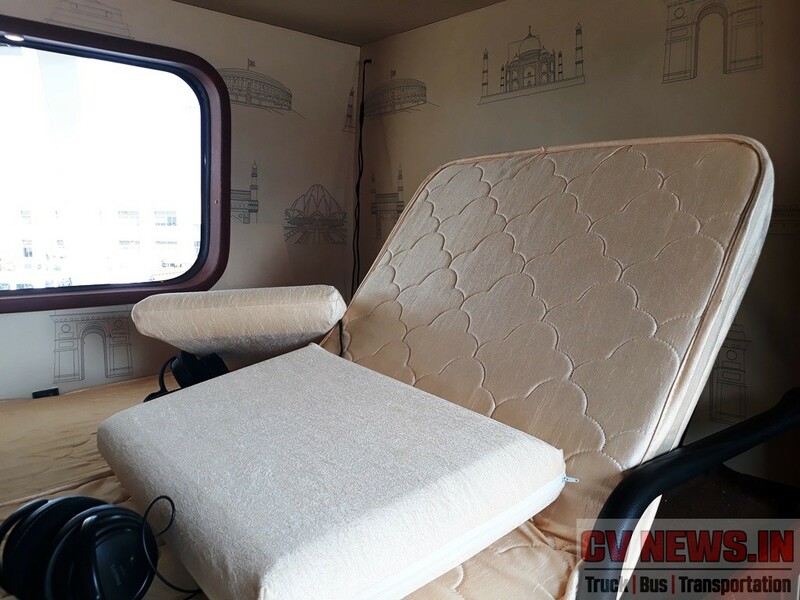 Coach featured a pneumatically operated reclining option for berths and hence passenger can either sleep or lean in a comfortable position – Quite a thoughtful feature. Similarly each berth had individual LCD screens and can be ‘switched on’, on need basis. Pneumatically operated Reclining berths and can be operated with a switch. The coach has a luggage capacity of around 6 Cu.m and that is inclusive of side and rear compartments. The rear luggage compartment is made without chopping FSM and space is neatly carved with FSM’s in place. We would like to mention about the emergency exit provided at the back. The door opens outwards and one can easily step out of coach in case of emergency by simply using the steps. 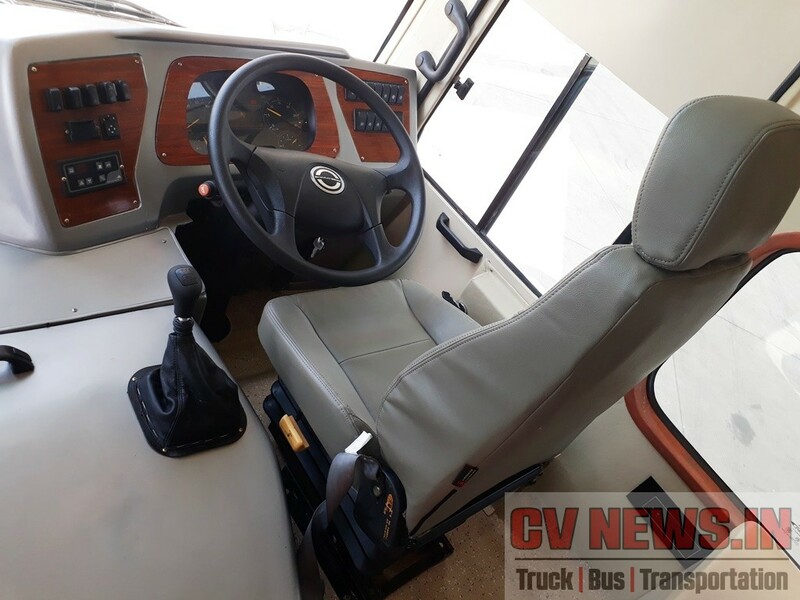 The dashboard is neatly laid out and driver will have a comfortable driving position. The BharatBenz 1623 coach offers unmatched engine oil change and gearbox oil change intervals of 1,00,000 km. This is a key USP and is currently the highest for any manufacturer in its segment. Service is a key and differentiating factor for vehicle sales. BharatBenz is increasing its network presence and is equally getting distributed across Nation. Apart from service centres, BharatBenz has Online technical information platform – Ascent (After Sales Central) a multilingual, animated system to facilitate information access at all service centres, Mobile service workshops and ensures to reach within 4 hours in case of emergency, Exclusive 24×7 customer support and technical hotline for all service needs, Customised on-site service support to ensure high uptime. 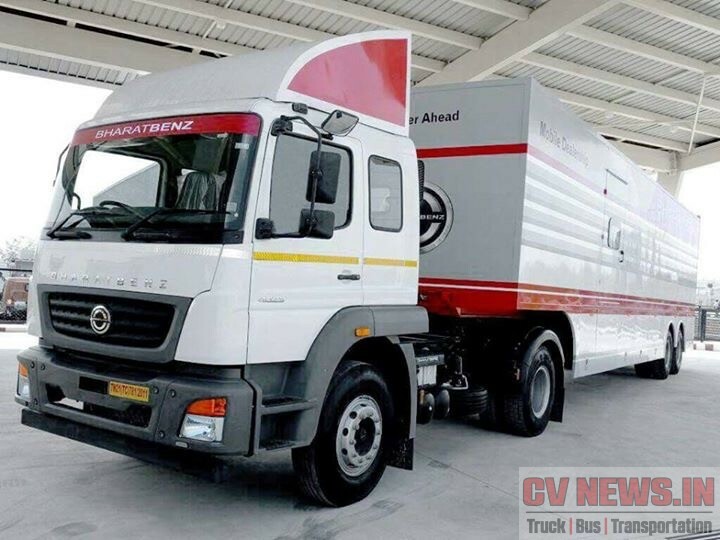 BharatBenz is expanding in after sales support largely and offers host of innovative financial and insurance packages as well and should aid the sales largely. 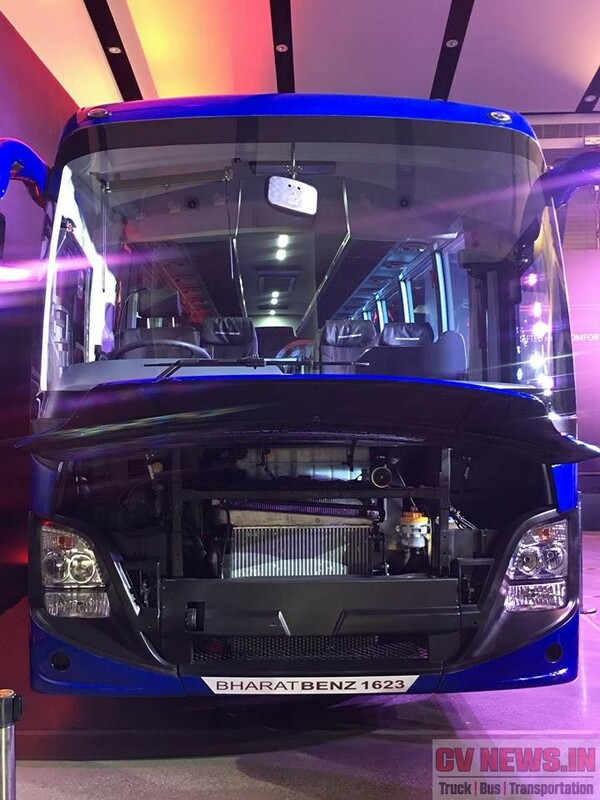 BharatBenz 1623 front engine seater coach is positioned in a segment which is actually reducing in Volume. If its AC Seater in Intercity application, its mostly towards rear engine coach and this is how the larger TIV areas like South and West are behaving in private sales. Otherwise Front engine buses are having huge potential in sleeper segment for the primary reason, they offer excellent RoI, as sleeper ticket fares are comparatively higher than seater ticket fare. Also the big market for AC seater segment in Intercity application is the volume driven by State Transport undertakings. The other application which still and widely prefers front engine seater is Tourist segment, and markets like Kerala, Delhi have potential for same. 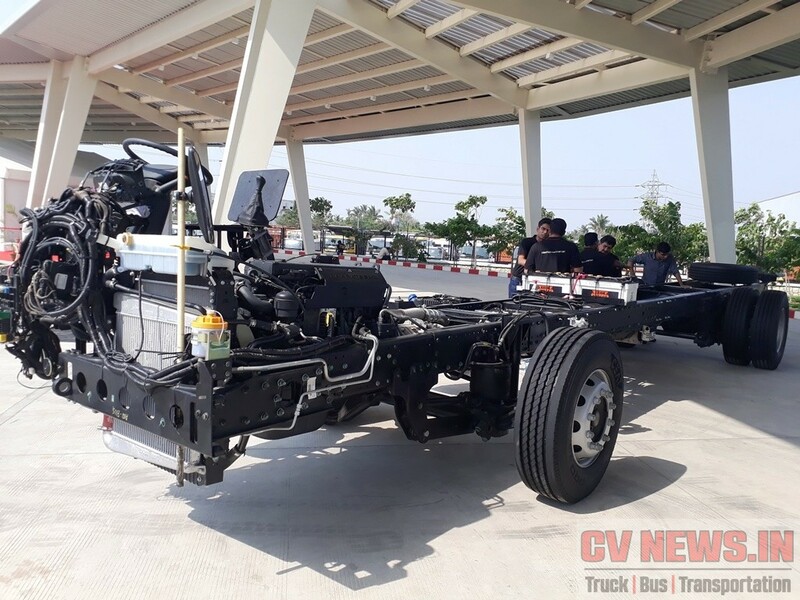 Tata Motors Magna, Ashok Leyland Freedom, Man – MG Mammoth are all addressing the same segment and every one of them have their own merits either at body level or at chassis level. 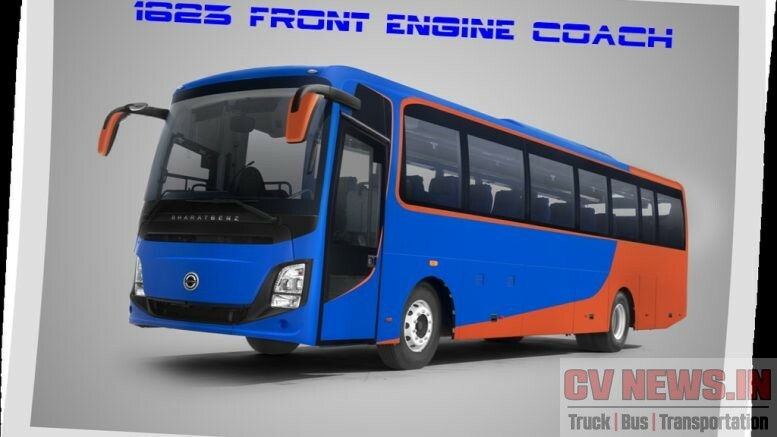 While BharatBenz has addressed most of the Customer requirements in 1623 coach, this will be strong contender in the front engine premium segment. We can look forward for these buses, not just in long distance Intercity application but in tourist application as well. 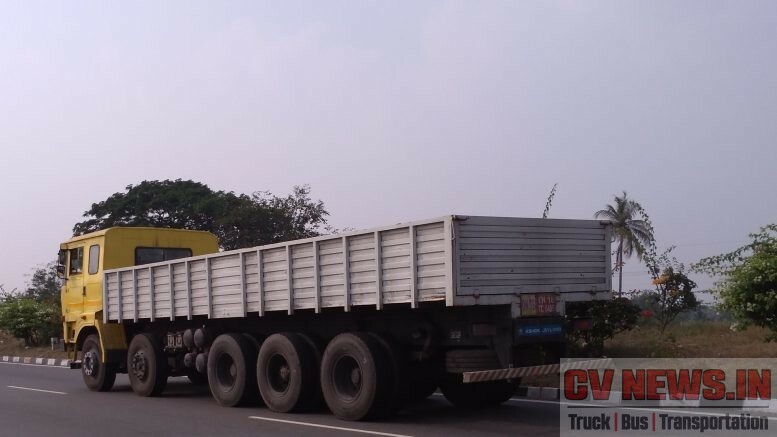 4 Comments on "Say Hello to BharatBenz 1623 front engine coach." 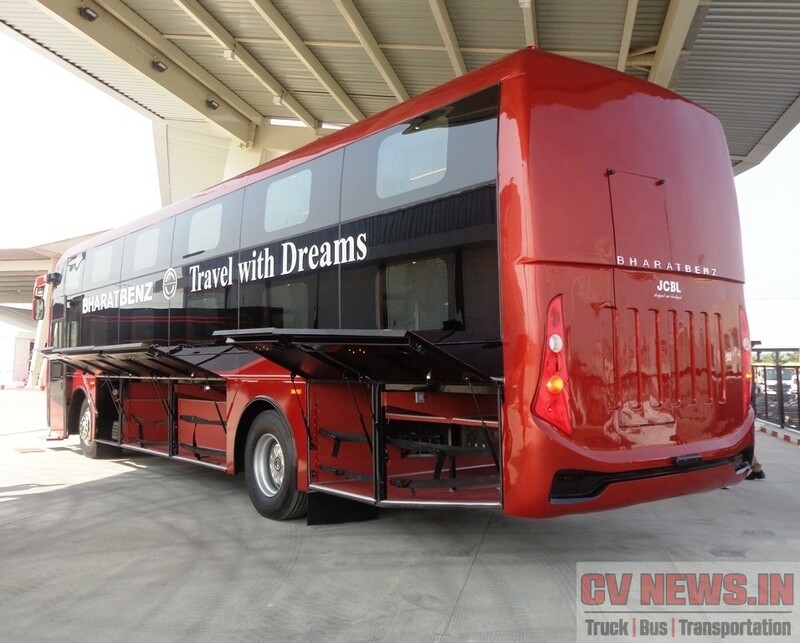 In continuation of my comments in the above link, this bus can only fit in private fleet. It is in direct competition with AL225hp. But there is one thing AL failed to showcase, the “brand”. I have heard passengers travelling in premium segments saying “I traveled in Volvo” or “I traveled in Scania”, whereas people travelling in FE buses say “I traveled in Seater/Sleeper”, very few passengers recognize the brand. If DICV can break this, fleet operators may start buying BB and put up the name ‘BharatBenz Seater/Sleeper’ in their website to attract customers. There is another twist, the battle of AL’s iEGR v/s DICV’s SCR. Since Inter-city travel doesn’t have much stoppages and most of the times driven in OD gear, SCR may have an upper hand! Well, hope to say hello to BB1623 on road soon. In my humble opinion, BB1623 will offer more mileage due to OD and SCR advantage and constant RPM. However the prices of Adblue are not available and the spray of adblue also affects the life of Catalytic converter. what is your opinion ? Taking the clue from what Bharat Benz has delivered in trucks, buses should perform well especially in the fuel performance side. But as the duty cycle is completely different between trucks and buses, we may need to wait for sometime to get field data. But overall school buses are performing well. Thanks for your comments Ashwin. Your comments are interesting and informative.